Hello members, welcome to week 17! This week’s share gave us a stalk of Brussels sprouts and parsley root, and if you haven’t cooked with these vegetables very much, we have recipes for frying and roasting them. We have a potato salad recipe, now that potatoes, celery, and onions are all in season together, and roasted breakfast potatoes that also call for bell peppers. If you used celery to make stock and still have some leftover, try the Blue Cheese and Pecan Stuffed Celery. Enjoy! Clockwise from top left: 1. freshly cut brussels sprouts placed face down in a hot pan with oil. 2. the sprouts flipped once. 3. Maple syrup and mustard drizzled in a spiral fashion, ready to be stirred in and served. 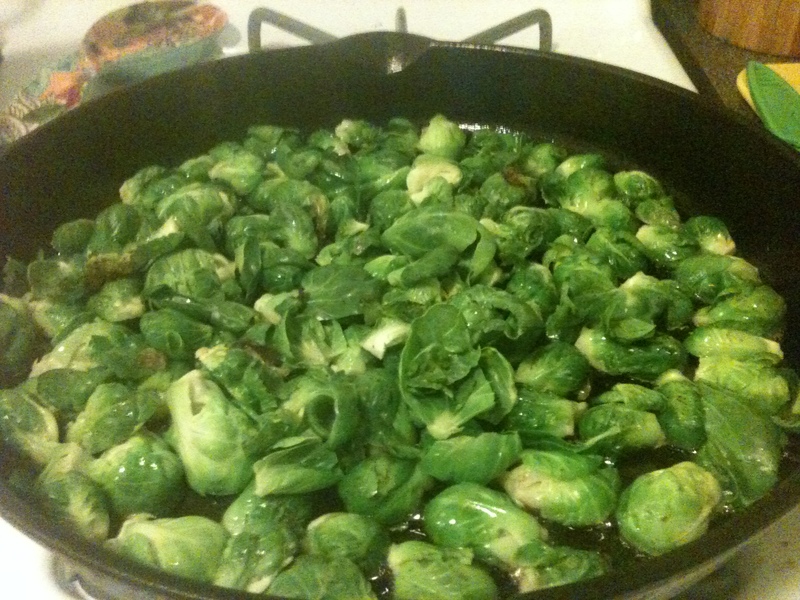 Pop the Brussels sprouts off the stalk and rinse in a colander. You may spin them in a salad spinner to dry them if you wish. Slice the sprouts in half. Heat oil or bacon grease over medium-high heat in a large cast iron skillet or frying pan. 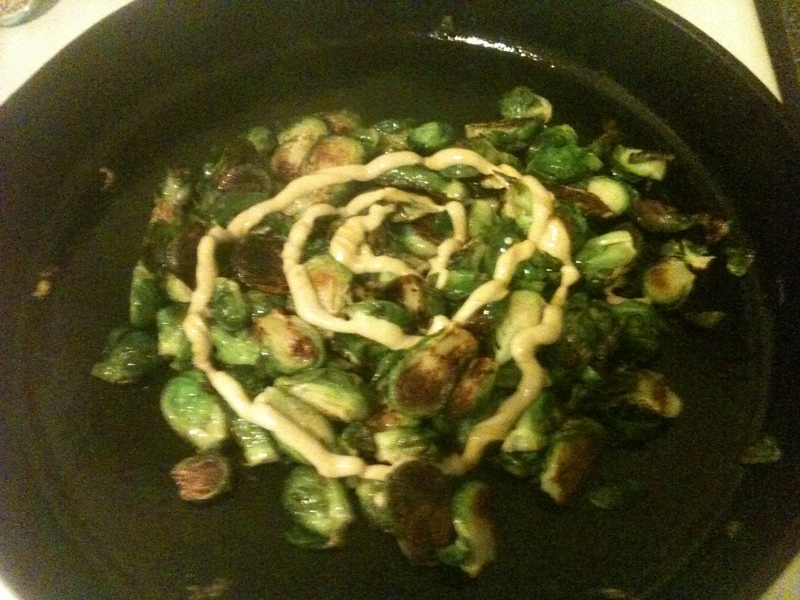 When drops of water sizzle in the oil, add the sprouts. If you have mad spatula flipping skills, flip all the sprouts so they are cut side down (but don’t burn your fingers! Safety first!). Let the sprouts fry for approximately 10 minutes then flip and stir with a spatula. Stirring the sprouts too often will cause the pan to lose heat, so I try to flip them only once while cooking. Fry them another 5-7 minutes, turn the stove off and add mustard and syrup, stir to mix, spoon onto plates, and devour. 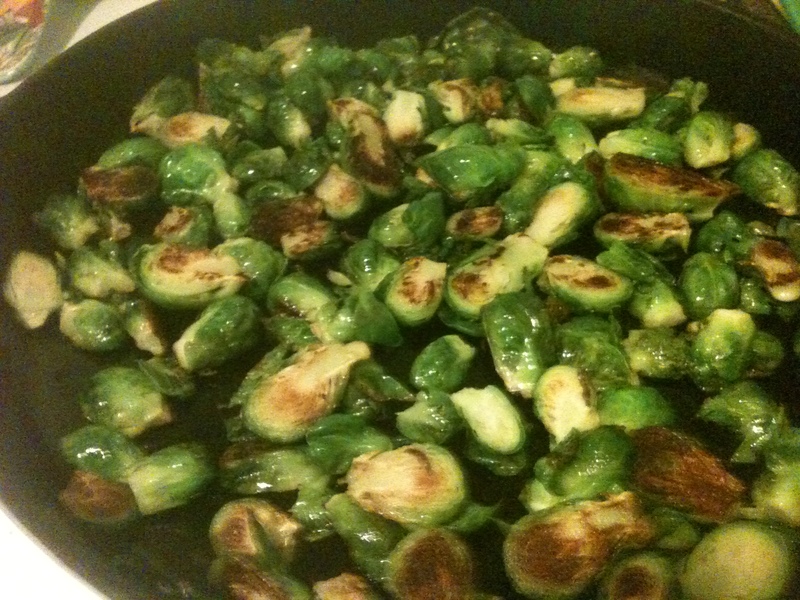 Then count the days until the next CSA pickup or farmer’s market where you can buy more brussels sprouts and make this dish again. We doubled this recipe when we made it, that way there is leftovers for lunch. We boiled the potatoes about 8-10 minutes which gave them a good texture, not too hard or too mushy. We also didn’t wait the full 3 hours to chill it, it was too good! 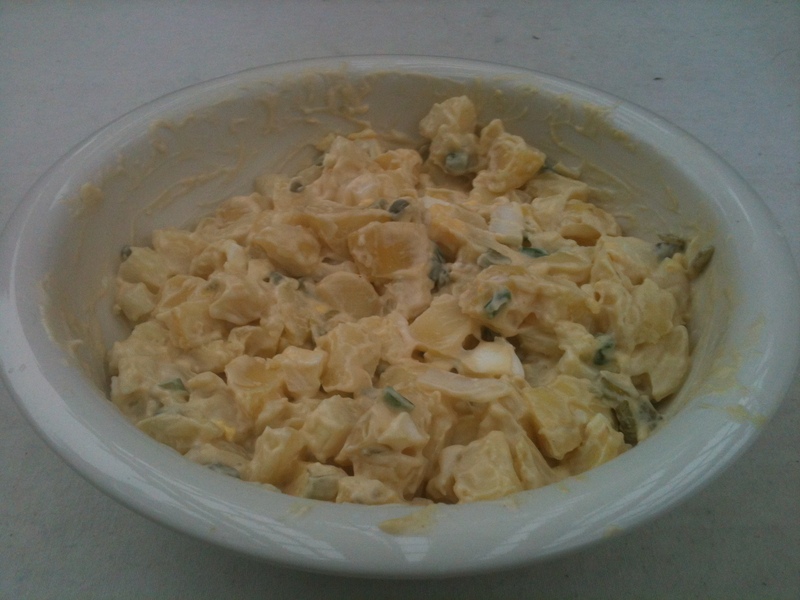 In a large bowl, combine the onion, celery, pickles, mayo, mustard, pickle juice, salt, pepper, sugar. Stir well to combine. Add in potatoes and eggs. Stir gently until well coated. Cover and chill at least 3 hours. Combine cheese, pecans, and cranberries. Spread on celery stalks, top with black pepper. If your celery stalks are on the narrow side, use them as dipping tools. That’s right, homo sapiens uses food to scoop up other food. Human ingenuity at its finest. Peel the parsley roots (or wash them very well) and chop into french fry-sized sticks. The thinner the sticks, the crispier they will get. Toss with oil, a dash of salt and pepper, and rosemary if desired. Roast on a baking tray for 20 minutes, toss, and place back in the oven for another 5-10 minutes until golden on the edges with crispy edges and a tender center. Pour potatoes onto a rimmed baking sheet. Bake for 20-25 minutes, tossing twice. Raise the heat to 500 degrees, bake until crisp and brown, 10-15 more minutes, tossing twice.